Howard Brenton has long raided history for its present-tense parallels and in England’s 17th-century civil war, he finds a nation intent on purging itself of elite corruption. In the end, however, the figurehead falls – quite literally when Charles I’s bonce drops from the block – but the culture itself survives into Oliver Cromwell’s own tyrannical reign. With Charles’s cavaliers defeated, Cromwell’s army enters Parliament to overturn its vote against bringing the king to trial, swung by Presbyterian MPs who have cut him a deal. The Roundhead leader forces the issue and enlists a radically Puritan court to ensure his – and, he insists, God’s – preferred outcome, even scheduling the execution before a plea has been entered. Yet Cromwell must contend with Charles’s refusal to recognise the court’s authority and, in its second half, Brenton’s play turns tense legal drama. Charles, reclining louchely in his chair, repeatedly undercuts proceedings and plays to the gallery, eventually forcing Cromwell to concoct new legislation to get God’s way. Brenton remains faithful to history – if sometimes bogged down by its details – and includes John Lilburne’s radical agitation and the resignation of army chief Thomas Fairfax. However, director Howard Davies keeps things crisply current with canny use of modern dress. In a Vandyke collar and cane, Mark Gatiss’s Charles is at odds with the starched black suits around him that lend Ballardian overtones to the fervent middle-class revolt. Indeed, it’s hard to ignore shades of Julian Assange in Douglas Henshall’s resolute Cromwell, while the filing cabinets that line Ashley Martin-Davis’s traverse stage suggest our own rifling through records to right past wrongs. In court, as Tom Vaughan-Lawlor’s quivering prosecutor John Cooke reads charges absolving the people of all blame, Charles seems as much a scapegoated despot as Simon Stephens’s Pa Ubu did here in January. But Brenton’s trick is to bind King and Lord Protector tight together like superhero and villain. 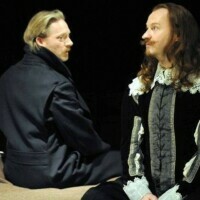 As Charles, Gatiss is commanding throughout – quietly meditative at first, then robust in his own defence – but Henshall is superlative. His utterly humourless Cromwell grows indignant and febrile as the king maintains dignity. Stillness becomes quaking gesticulation and he seems every bit as dictatorial as the accused, finally bursting into giggles as he signs the death warrant. Absorbing and rich, 55 Days is a rewarding warning against revolutions that turn 360 degrees.